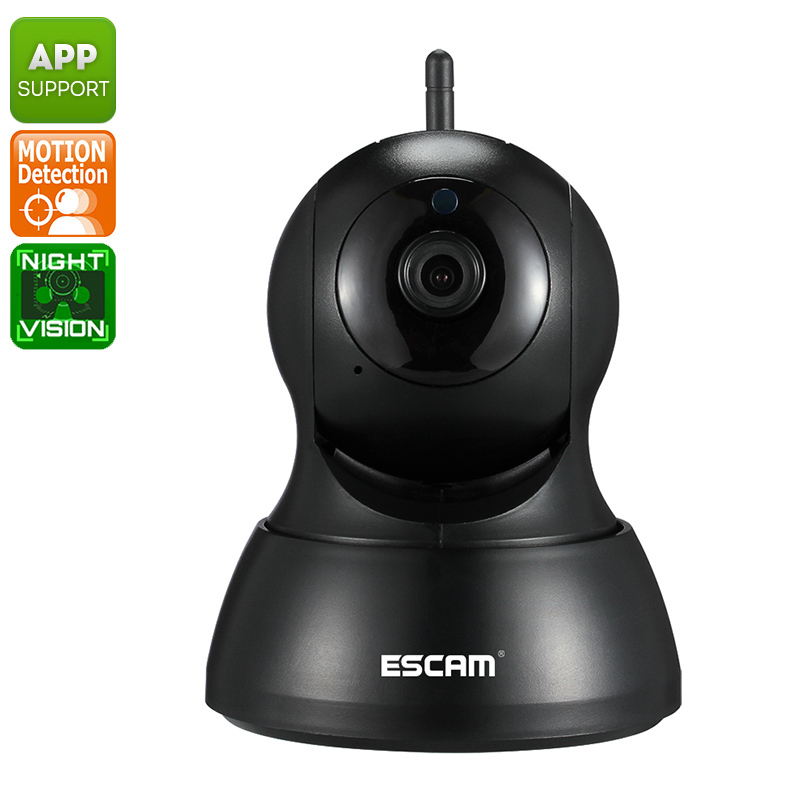 Successfully Added Indoor IP Camera ESCAM QF007 - 720P, H.264, Wi-Fi, Night Vision, Pand & Tilt, Motion Detection, iOS & Android App to your Shopping Cart. The QF007 IP camera is a compact indoor security cam that lets you keep track of whats going on inside your home. It has a 1/4-Inch CMOS sensor, so can deliver HD resolution footage in 720P. There is support for motion detection allowing it to automatically detect any people and notify you of the presence. With a 10-meter night vision if can offer round the clock surveillance. Including wireless network support, this indoor IP camera is easy to set up and requires just a power cable. This brings greater freedom for where you can set up the camera as you don't need wired internet connectivity. Just plug in the camera to the mains and connect to your Wi-Fi network. There are a built-in microphone and speaker letting the camera double as a baby monitor. You can also use it as a video conferencing camera for your computer with software such as Skype or Hangouts. The ESCAM QF007 IP camera has a built-in motor that lets it rotate through 355 degrees and tilt up to 90 degrees. This allows the one camera to cover a large area and monitor spaces that would normally require 2 or more cameras. The camera video can be recorded directly to a micro SD card and with 64GB support as well as lossless H.264 compression your able to store important footage locally. With the dedicated iOS and Android app, you can monitor the live video feed remotely via your phone or tablet PC. Pair the camera with your phone and you can check the kids are behaving when you're out of the room. you can also keep tabs on family pets or use the camera to monitor your little ones when they sleep. Suitable for a range of home and business uses the ESCAM QF007 IP camera comes with a 12 months warranty, brought to you by the leader in electronic devices as well as wholesale IP Cameras.